The market will be held on Sundays, from 4 pm to 8 pm, in the Kahului Shopping Center parking lot fronting Kaahumanu Avenue, between Burger King and Maui Style Market. The event will be open to the general public and will showcase island vendors (crafters, artisans, food purveyors, and more); entertainment; food trucks; and Hawaiian Cultural traditions and practices. Public admission and parking is free. The Maui Sunday Market is supported by the County of Maui Mayor’s Office of Economic Development. To become a vendor, sponsor and/or for event information, visit www.MauiSundayMarket.com, email info@mauifoodtechnology.org, or call 888-948-MFTC (6382). On September 6-8, 2017, Maui Food Technology Center (MFTC) participated in Japan’s largest gift fair, the 83rd Tokyo International Gift Show. Held at the Tokyo Big Sight Exhibition Hall in Tokyo, this year’s event, themed “Creation and Discover,” attracted over 354,000 buyers and 2,597 exhibitors, including 276 companies from 13 countries and regions. MFTC procured booth spaces for four Maui County businesses to sell their products in the Hawaii Pavilion. Many of those selected were Made in Maui County Festival vendors who had completed Maui Food Technology Center’s export readiness training program. 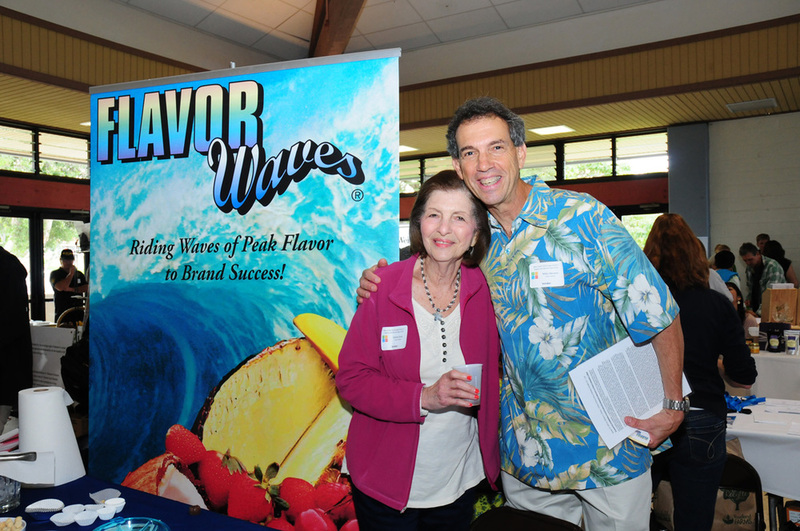 Vendors who participated were: Zellee Organic, Maui Upcountry Jams & Jellies, Maui Preserved, Wrappily, Zen Island Kitchen, Maui Winery and Maui Nui Wear. MFTC extends a big mahalo to Neal Arakaki of Jaxie Corporation who worked with the event’s Japan coordinators and to DBEDT and the County of Maui who provided marketing opportunities for Maui County businesses to participate at an affordable cost. For some companies, it was their first experience marketing to an international audience. Molokai can cook! Just ask the group of talented home cooks who took on Maui Food Technology Center’s (MFTC) 1st Annual Ka Molokai Makahiki Beach Bucket Food Fight. Held on January 26, 2018 at the Mitchell Pauole Center in Kaunakakai, Molokai; five teams of two were tasked with creating an appetizer and entrée using a selection of basic pantry items plus a few secret ingredients in each dish. Oh, and did we mention, they only had a limited time to accomplish this? But never fear, participants were up to the challenge showing their impressive culinary chops in front of this year’s esteemed judges, event host Chef Adam Tabura and MC Makani Tabura. This year’s judges were Woody Hiro, Executive Chef at Hiro’s Ohana Grill, Shirley Rawlins, President, Ka Molokai Makahiki and Uilani Lima. First prize went to Team Broke da Mouth Lindsey Crivello and Tina Matthews, who took home a total of $ 450.00 in cash and prizes and round trip airfare to Maui for their winning dishes. 2nd place winners, won $ 225.00 in cash and prizes were Team Na Opio Molokai, 12 year old KiraKai Yamasaki-Gray and 13 year old Shaelynn Kong. 3rd place winners, won $ 150.00 in cash and prizes were Team Incredible Edibles, Chris and Patricia Hammond. Local products used included Shrimp from Molokai Sea Farms, Uala (Sweet Potato) from the Decoites L & R Farms and Molokai Bread from Kanemitsu Bakery. Crivello and Matthews will compete against the winners of the Lahaina and Lanai Cook Offs on Saturday April 7th at the Maui Ag Fest and the Maui Tropical Plantation. Supporting the local food producers and food products which use locally grown foods is a key mission of MFTC. According to Mahi, “Hawaii needs to reduce its dependence on bringing food from out of state. While top grade products command the best price, off grade products can be used in the food service industry or in value-added products. While MFTC’s expertise is in helping to bring delicious and safe products to market, we also realize there are other opportunities to educate people about using local ingredients. This Home Cooks Challenge is one way we’re conveying the message of the importance to support and buy local. A big Mahalo goes to event sponsors: State Farm Chad Santiago’s Office in Lahaina, Maui Economic Development Board, County of Maui Mayor’s Office of Economic Development, Flavor Waves, Monsanto Hawaii, Rawlins Service Station, Friendly Market, Hawaiian Isles Unlimited LLC, and The Spice Rack Hawaii. For more information on Maui Food Technology Center, visit www.mauifoodtechnology.org, email info@mauifoodtechnology.org or call 808-878-3652. The Maui Food Technology Center (MFTC) along with the County of Maui Mayor’s Office of Economic Development is currently seeking local food businesses interested in participating in the 41st International Food and Beverage Exhibition, “FoodEx Japan.” Considered the largest food trade show in Asia, the event will be held on March 8-11, 2016 in Makuhari Messe in Chiba, Japan. Interested businesses are encouraged to attend an informational meeting on Thursday, October 15, 2015, from 10:30 am – 12 pm, at the Maui County Business Resource Center located in the Maui Mall (across from Pizza Hut). To register and/or for more information, email info@mauifoodtechnology.org or call 888-948-6382. Selected businesses will receive assistance from the County of Maui Mayor’s Office of Economic Development and MFTC. Preference will be given to companies who are export ready and have products with marketing potential. Products must be produced and/or manufactured in Maui County. Each year, FoodEx Japan attracts more than 77,000 domestic and international buyers. In 2015, the show had 2,975 exhibitors from around the world in 3,500 booths. Earlier this month, the County of Maui and MFTC brought seven local companies to the 80th Tokyo International Gift Show. TIGS is the largest international trade show in Japan and drew over 200,000 domestic and international buyers over the three-day period. TIGS is one of the largest personal gift and decorative accessory international trade fairs in the world. The three-day will be held on September 2-4, 2015 at the Tokyo Big Sight in Tokyo Japan with over 2,500 exhibiting companies participating and 200,000 visitors expected to attend. Maui Food Technology Center (MFTC) announces the winners of their 2015 Hawaii Food Products Recipe Contest, which was held this past Saturday, April 4th during the Maui County Ag Festival at the Maui Tropical Plantation in Waikapu. Aimee Singer of Lahaina took 1st place for her Maui Ketchup, Michelle Jones and Katherine Crosby of Two Chicks in a Hammock captured 2nd place with their Hawaiian Chili Pepper Salt, and John Draeger of Pukalani took 3rd place with his Hawaiian Pumpkin Soup. Winners will receive assistance from MFTC consultants with nutritional label or food science services to help them take their product from idea to the store shelves. The 1st place winner will receive consultation services valued at $1,500, 2nd place services valued at $500, and 3rd place services valued at $250. Recipes were judged on taste, appearance, commercial viability of recipe, and the best use of Hawaii grown and/or made ingredients. This year’s contest judges were Kuulei Teshima, a retired chef; Sharon Hurd, Acting Administrator Agricultural Development Division for the State Department of Agriculture; Paul Gober of Island Trays; and Jeanne Skog, CEO & President of Maui Economic Development Board. Hawaii Food Products Recipe Contest organizers are currently seeking new, locally made food products that utilize Hawaii grown and/or made ingredients. Sponsored by the Maui Food Technology Center (MFTC), the contest will be held during the Maui County Ag Festival at the Maui Tropical Plantation in Waikapu on Saturday, April 4. Hawaii residents 18 years of age or older are eligible to enter. Each entry form must include a list of ingredients in the recipe, specify the Hawaii ingredients, and include a short story about the product. Six servings of the contest entry product must be delivered between 9 am and 10 am on Saturday, April 4, to the Grand Taste Education Tent at the Maui County Ag Festival. Recipes will be judged on taste; appearance; commercial viability of recipe; and the best use of Hawaii grown and/or made ingredients. The more local ingredients, the more points will be awarded. Winners will receive assistance from MFTC consultants with nutritional label or food science services to help them take their product from idea to the store shelves. The First Place winner will receive consultation services valued at $1,500, Second Place services valued at $500, and Third Place services valued at $250. For an official contest entry form, visit www.MauiFoodTechnology.org or call 808-948-MFTC (6382). Send completed entry forms via email info@MauiFoodTechnology.org or fax 888-887-4495 no later than April 1. Established in 2004, Maui Food Technology Center is a non-profit organization focused on growing Hawaii’s food industry, connecting students, food producers and farmers through the practice of food science. MFTC provides non-profit outreach, and business incubation services designed to identify and develop opportunities for local entrepreneurs to be successful in the agriculture and food product industries. 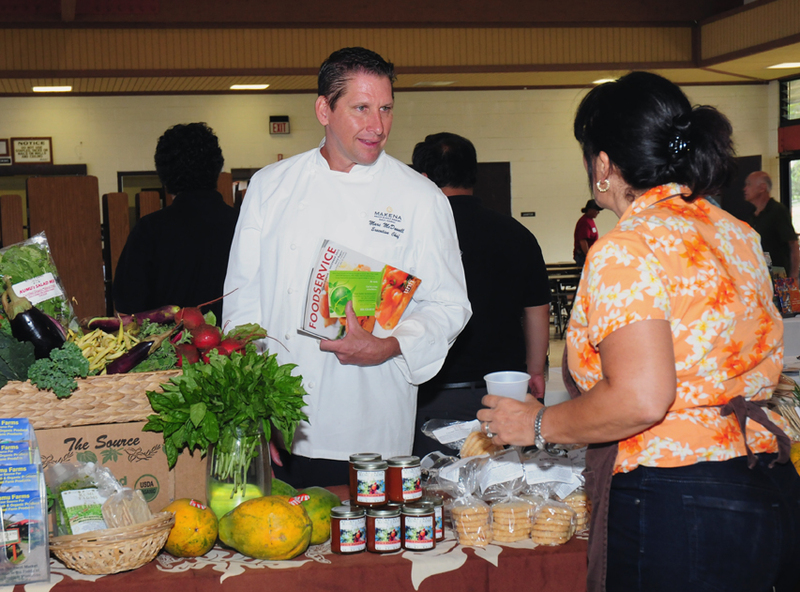 Maui Food Technology Center extends a big mahalo to the exhibitors, sponsors, speakers, volunteers and attendees of our 2nd Annual Supply and Service Expo held on Wednesday, February 18, 2015 at the Hannibal Tavares Community Center in Pukalani. It was extremely gratifying to see the many attendees who were pro-actively seeking products, services and resources to help them jumpstart and/or grow their businesses. Many of our vendors also took advantage of the opportunity to network with other vendors, establishing invaluable professional contacts. MFTC is passionate about helping businesses by bringing farmers and food manufacturers together along with the food trade and culinary students to encourage use of locally grown ingredients. Our hope is that we can continue to create more demand for Hawaii agriculture by specifying them in food products. We also extend our gratitude to today’s event speakers: David De Candia, Director of Tea for Coffee Bean/Tea Leaf; Neil Ertmer, President of Bay Area Packaging; Neal Arakaki, Hawaii Pavilion Project Manager from Jaxie Corp.; Ken Dozier, Executive Director of Western Research Application Center; and Christina Gilbert, Purchasing Director of Mana Foods. Lastly, we cannot say enough about our major event sponsors who made today’s Expo possible. These community-minded companies are BIG champions of our island’s businesses and non-profits and we are extremely grateful for their support. Our 2015 major sponsors are: County of Maui Mayor’s Office of Economic Development, Innovate Hawaii, A&B Kokua Giving, The Maui News, Pacific Media Group, Maui Now, Netcom Enterprises, Flavor Waves and Maui Printing Company. Until next time . . . A hui hou. On Wednesday, February 18, 2015, Maui Food Technology Center (MFTC) will hold their 2nd Annual Supply and Service Expo at the Hannibal Tavares Community Center in Pukalani from 10 am to 3 pm. The event features a tradeshow comprised of state and county business development services; food equipment suppliers, food ingredients manufacturers/distributors, labels and packaging suppliers/designers, dealers and traders, social media professionals and brand identity experts. Specialized presentations by industry experts will also be scheduled throughout the day. Featured speakers include: David De Candia, Director of Tea for Coffee Bean/Tea Leaf on “Tea Trends” at 10:30 am; Neil Ertmer, President of Bay Area Packaging on “Food and Produce Packaging and Food Inspection” at 11:15 am; Neal Arakaki, Hawaii Pavilion Project Manager from Jaxie Corp. on “Food Manufacturing Exhibitors at Tokyo International Gift Show” at 12 noon; Ken Dozier, Executive Director of Western Research Application Center on “Cost-share grants for Manufacturing and Agricultural Firms” at 12:45 pm; and Christina Gilbert, Purchasing Director of Mana Foods on “Buying Local” at 1:30 pm. Pre-registered attendees are eligible to win a $200 Hawaiian Airlines gift card and a $50 gift card towards a car rental from Enterprise Holdings – need not be present to win. The first 200 people will receive a free Expo tote. Public admission is free. For more information on becoming an exhibitor and/or attending the Supply and Service Expo, visit www.MauiFoodTechnology.org or call 888-948-6382. Major event sponsors include: County of Maui Mayor’s Office of Economic Development, Innovate Hawaii, A&B Kokua Giving, Pacific Media Group, Maui Now, The Maui News, Netcom Enterprises, Flavor Waves and Maui Printing Company. Maui Food Technology Center (MFTC) is currently seeking local vendors for the Hawaii Pavilion at the 80th Annual Tokyo International Gift Show (TIGS) to be held on September 2-4, 2015. TIGS is the largest international trade show in Japan with over 2,500 companies marketing gifts, consumer goods and accessories to over 200,000 domestic and international buyers. Booth space is open to Hawaii companies interested in marketing their products abroad. Exhibitors must meet SBA and “Made in Hawaii” guidelines. This includes being registered to do business in Hawaii, products made in Hawaii, and products must be able to be imported into Japan. Products exhibited at the 2014 show include produce, honey, beverages, stationery, clothing, textiles, foods, salt, jewelry, soap, woodwork and more. Maui County plans to help qualified companies participate in the show. While it is recommended that the company attend the show in person, it is not required. Thanks to a grant from the County of Maui Mayor’s Office of Economic Development, MFTC representatives will be attending the show on vendors’ behalf in an effort to make this opportunity more affordable for local businesses. A meeting for interested companies will be held on Thursday, January 15, 2015 at 11 am at the Pono Center located at 62 N. Market Street in Wailuku, 3rd floor Training Room. If interested, please register with the Maui Food Technology Center at info@mauifoodtechnology.org. FDA recently announced that January 1, 2018 will be the uniform compliance date for food labeling regulations that are issued in calendar years 2015 and 2016. FDA periodically issues regulations requiring changes in the labeling of food and coordinates the effective dates of these labeling changes to reduce the economic impact to the food industry of having to respond separately to each change. With a uniform compliance date, industry can plan for the use of existing label inventories and the development of new labeling materials. Attention: Facilities that manufacture, process, pack, or hold food: Less than two more weeks to register your facility! You will NOT get a new registration number. Regardless of updates made outside of this window, you must renew your registration during October 1 and December 31, 2014. The requirement to update registration when facility information changes is still in effect. Check FDA’s registration renewal page for more information. Section 415 of the Federal Food, Drug, and Cosmetic Act (FD&C Act) [21 U.S.C. § 350d] requires food facilities that are required to register with FDA. Please be advised that “updating” your registration is a different function than "renewing” your registration. During the renewal period, you will not see the “Update” button listed on the FFRM main menu, until the registration is renewed. If a registration is not renewed by 11:59 PM on December 31, 2014, the registration is considered expired and will be removed from your account. If you have any further questions please contact the FURLS Helpdesk: by phone 1-800-216-7331 or 301-575-0156; or by email FURLS@fda.gov. The Maui Food Technology Center (MFTC) announced that online applications are now being accepted for exhibitors interested in participating in their 2nd Annual Supply and Service Expo. This annual tradeshow for manufacturers and entrepreneurs will be held on Wednesday, February 18, 2015, from 10 am to 3 pm at the Hannibal Tavares Community Center in Pukalani. Exhibitors who are encouraged to participate include manufacturers and distributors of food, ingredients, equipment and packaging supplies; dealers, brokers and traders; and business services and educational groups that work with the food and hospitality industries. The public will enjoy relevant educational sessions featuring experts in their field, a tradeshow comprised of national, state and local vendors, and networking opportunities ideal for entrepreneurs and existing businesses interested in expanding and/or rebranding themselves. Among those expected to attend will be food processors and manufacturers, restaurants, delis and bakeries, caterers, independent markets/stores, specialty stores, gourmet product distributors and agricultural businesses. 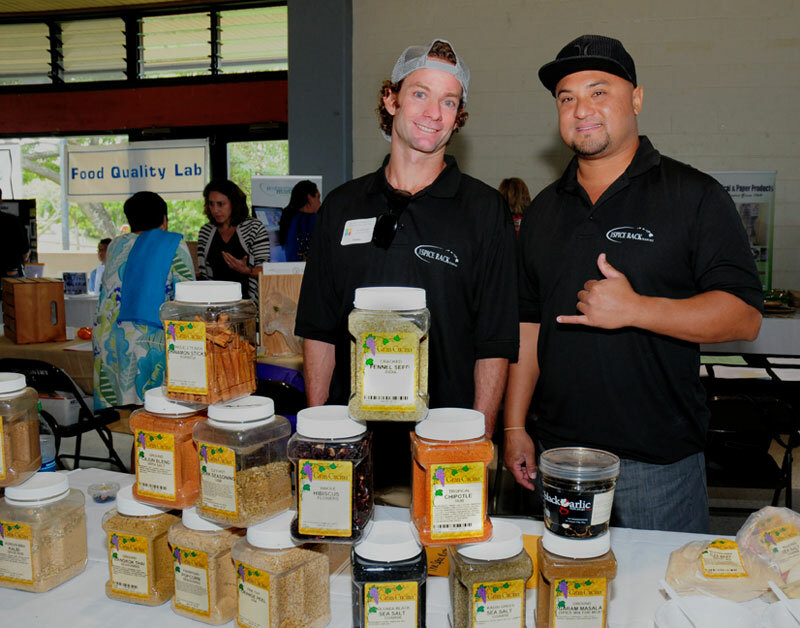 "This Expo was a perfect forum for Maui's food production industry's various shareholders to come together under one roof to share ideas and concerns,” said Tai Kahn, Lab Director of FQLabs who attended the inaugural 2014 event. “It gave everyone an opportunity to meet the regulators, growers, processors, technical experts, and various vendors that provide services and supplies to the food industry. It was a terrific ‘one stop’ shop for getting help, sharing ideas and getting answers." Exhibitor fee is $100 for vendors for early registration (prior to January 18, 2015) or $150 for late registration. Fee may be waived for qualified non-profit organizations. Public admission is free for qualified attendees. Click here for an exhibitor application. Event sponsorship opportunities are also available. Read more on our Sponsorship page. For more information email info@mauifoodtechnology.org or call 888-948-6382. “Ulu was my inspiration,” said John Cadman about his winning recipe, Maui `Ulu Hummus. “It’s a very versatile ingredient. I’ve been making pies with it, and thought hummus was a natural.” Pictured: Recipe contest judge Kamaunu Kahaialii presents Cadman with his 1st place certificate. Maui Food Technology Center (MFTC) proudly announces the winners of their 2014 Hawaii Food Products Recipe Contest, which was held this past Saturday, April 5th during the Maui County Ag Festival at the Maui Tropical Plantation in Waikapu. John Cadman of Haiku took 1st place for his Maui `Ulu Hummus, KimAnn Magno of Lahaina captured 2nd place with her Lilikoi Butter, and Joseph Kanahuna of Haiku took 3rd place with his Papa Joe’s Chili Pepper Water – Special. A total of 16 entries were submitted which included beer bread, crackers, macadamia cheeses, herb butter, sauces, candies, and even chocolate covered beef jerky. Recipes were judged on taste, appearance, commercial viability of recipe, and the best use of Hawaii grown and/or made ingredients. This year’s contest judges were Gary Butler, Produce Manager for Mana Foods; Nina Ann Tanabe, Consultant at Pacific Food Technology; Kamaunu Kahaialii, General Manager of Hui Ho`omo`a; and Carla Tracy, Food Editor of The Maui News. Maui Food Technology Center is a 501(c)3 organization dedicated to growing Hawaii’s food industry, connecting students, food producers and farmers through the practice of food science. Hawaii Food Products Recipe Contest organizers are currently seeking new, locally made food products that utilize Hawaii grown and/or made ingredients. Sponsored by the Maui Food Technology Center (MFTC), the contest will be held during next month’s Maui County Ag Festival at the Maui Tropical Plantation in Waikapu. Click here for an official contest entry form. Send completed entry forms via email info@MauiFoodTechnology.org or fax 888-887-4495 no later than April 2. Six servings of the product must be delivered between 9 am and 10 am on Saturday, April 5, to the Grand Taste Education Tent at the Maui County Ag Festival. MFTC's 1st Annual Supply and Service Expo a Resounding Success! Maui Food Technology Center extends a big mahalo to all the sponsors, donors, participants, attendees and volunteers who helped make our 1st Annual Supply and Service Expo a resounding success! Held on Wednesday, February 26th at the Hannibal Tavares Community Center in Pukalani, the event attracted nearly 50 exhibitors and almost 500 attendees. Click here for a copy of this year’s Expo program which includes a listing of our participating exhibitors and their contact information. View our photo gallery or our Facebook page. Read what people are saying about the event. We applaud our islands’ small businesses for serving as an integral part of our community and economy. On Wednesday, February 26, 2014, Maui Food Technology Center (MFTC) held their 1st Annual Supply and Service Expo at the Hannibal Tavares Community Center in Pukalani. The event, which attracted nearly 500 attendees and almost 50 exhibitors, offered assistance to new or existing food producers working on developing a product and getting it into the marketplace, entrepreneurs looking to expand their network opportunities and resources, and consumers interested in attending the tradeshow and hearing the latest from experts in the food manufacturing, distribution and hospitality industries. 2014 1st annual Maui Food Technology Center Expo from Sascha Bauml on Vimeo. On Wednesday, February 26, 2014, Maui Food Technology Center (MFTC) held their 1st Annual Supply and Service Expo at the Hannibal Tavares Community Center in Pukalani. The event, which attracted nearly 500 attendees, offered assistance to new or existing food producers working on developing a product and getting it into the marketplace, entrepreneurs planning to expand their network opportunities and resources, and consumers interested in attending the tradeshow and hearing the latest from experts in the food manufacturing, distribution and hospitality industries. Nearly 50 exhibitors participated in the tradeshow which featured manufacturers and distributors of food, ingredients, equipment and packaging supplies; dealers, brokers and traders; business services and educational groups that work with the food and hospitality industries; and brand identity and marketing industry professionals. Major event sponsors included: County of Maui Office of Economic Development, Fred Baldwin Memorial Fund, Tri-Isle Resource Conservation and Development, The Maui News, KPOA-93.5 FM, MauiNow.com, and Maui Printing Company. A big mahalo to all the sponsors, donors, exhibitors and volunteers who contributed to the success of Maui Food Technology Center’s 1st Annual Supply and Service Expo held on Wednesday, February 26th at the Hannibal Tavares Community Center in Pukalani, Maui. Nearly 50 exhibitors participated and almost 500 attendees turned out for this exciting event that brought together farmers, food producers/manufacturers, food services, industry professionals, state and county services, small businesses and entrepreneurs. For a copy of this year’s Expo program click here. For information and/or to participate in next year’s Expo, contact us.